Efforts by the Labour Party to promise lower power bills have been labelled "cheap, populist rubbish" by Finance Minister Bill English because of Labour's track record on electricity prices. Professors Tony Blakely of the University of Otago, and Cliona Ni Mhuchu of the University of Auckland, gave the proposal cautious support as a move to improve health and reduce inequalities. "Earlier this year we published research showing an 11 percent increase in purchasing of fruit and vegetables when 12.5% was taken off the price," Professor Ni Mhurchu said. The finding was from a large randomised trial of 1,100 New Zealand shoppers, and published in the American Journal of Clinical Nutrition. ...so let's dump the pretense that the idea has no merit, so where do we fund this greatv idea? Simple. We lower the blood alcohol level which save 30 lives, prevent 660 injuries AND save us $238million. It's incredible isn't it? According to National, taking GST off fresh fruit and vegetables is too expensive, where as waiting two years to lower the blood alcohol level which will kill 60 NZers, cause 1320 injuries and cost $476 million dollars is perfectly fine. If you look further into that study you will see what they actually found is that people consumed more fruit and veg but didn't decrease their consumption of other food, so if obesity is the health concern, lowering gst on fruit and veg only increases caloric intake worsening the problem. Also could you provide a reference to that amount we would supposedly save by lowering the blood alcohol limit, I have a hunch that it is a social cost measure, not a cost to the govt. I think the National Party Research Unit needs to sharpen your spin lines up Sue. With people about to have less in the pockets overall from the inflationary spike GST will cause that will eliminate the crumbs being handed out to fund john keys tax cut, they won't have that money to spend over all Susan, so the health impact of the study becomes even more profound. As for the costs of lowering the alcohol blood level, you should know that mate, your Government ignored them, check with them. 60 lives, 1320 injuries and $476 million dollars seems a high cost to sucking up to the booze industry. Taking a study that produces the result that lowering the price of fruit and veges increases the amount of food purchased will lower obesity related illnesses (which I realise you didn't specifically claim but other proponents of the policy have) is misleading at best. You may hate National Susan but you spin like them, please cut and paste where I said anything about obesity in this post please, seeing as that is the thrust of your post it should be easy to point out. And I have answered, the study shows people bought more fruit and vegetables when GST was removed, your attempt to spin that as 'people continued to buy other food' has zero to do with the point I made about health. Are you seriously suggesting eating more fruit and vegetables won't be healthier for people? I also note the report didn't include all that 'other food' would be taking on board an extra 2.5% in cost. If you don't like my response Susan, don't attempt to put words in my mouth. It's incredible isn't it? Some people think that by taking GST off vegetables then the price will not rise due to market forces thus negating the effect and leaving a huge fiscal hole in the crown budget. Just who could be that stupid? Sure but they wouldn't rise as much anon so it would still be cheaper. I'm amazed that the right wing scream about catching up with Australia yet won't follow their lead on this issue. This post was the least offensive out of the three you posted, so it got on. You don't need a fake fb profile anon when ISP addresses work just as well. "Sure but they wouldn't rise as much anon so it would still be cheaper." Really, and like you actually have proof of this? LMAO - shucks the loss of an anonymous right wing troll, whatever shall I do? Or, we could end ShonKey's tax cuts for the rich. Hey, they're all liers anyway. 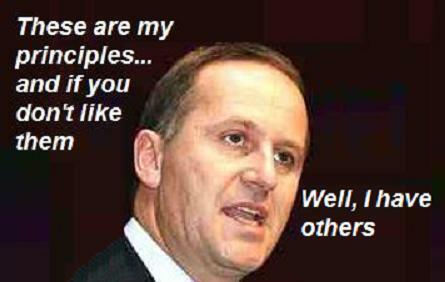 Let's not forget that Key said they would never raise GST if National got voted in. Then lo and behold, they do it anyway. Liers!